Review by KT Bell, photos by Stu B. In spite of all our good efforts, enthusiasm and eager anticipation following last year’s fantastic Gum Ball, Stu and I found ourselves behind schedule driving in to the darkness from Sydney, desperate to get to Lower Bedford for the 2012 Gum Ball and it’s stellar line up. We arrived at 9pm, just in the nick of time before the gates closed for the night. In the headlights of the car we set up our modest camping facilities only a few hundred meters from the main festival area with the roaring set of The Tongue as our soundtrack. To my delight, we managed to catch the last act of the night, the newly reformed The Bakery. While not really folk, they’re worth checking out in their new format. 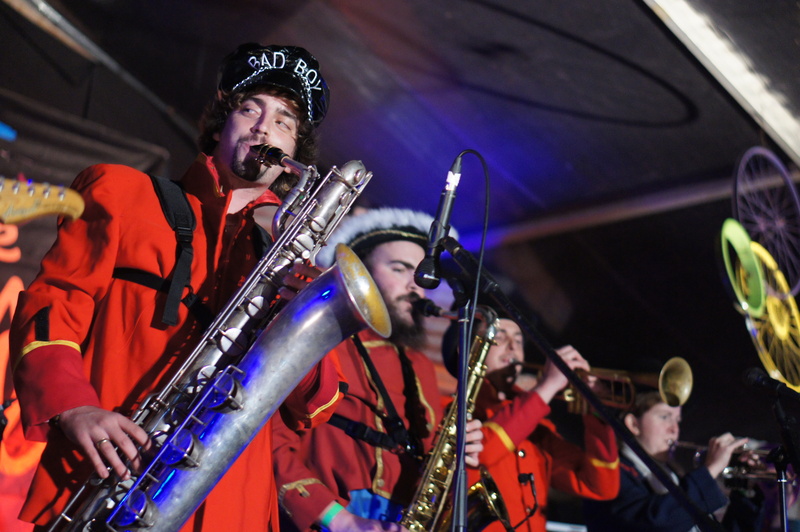 After an extended period of absence, the band took on a new line up for the 2011 Woodford Folk Festival and their act has been going from strength to funky strength ever since. As the festival’s sound system fell silent, the crowd migrated to the silent disco to revel on in to the early morning. Amusingly to those watching from the outside, it looked like a silent, shuffling human zoo exhibit with the occasional rousing group rendition of some classic chorus. As the silent disco serenaded us with another round of “they paved paradise to put up a parking lot, ooooh, bop bop bop…” we headed to bed in readiness for a huge Saturday to come. In the morning light, we rose to discover the sprawling tent city nestled among the gum trees and the impressive set up of the seasoned gum-ballers surrounding us. Complex lounge room style common areas complete with couches, tarps stretched over cars, vans and tents, lean to’s and all manner of camping comfort and conveniences. We stumbled off to the festival arena in search of coffee and breakfast, passing impromptu camp kitchens, gas cookers perched on tow bars and the likes with eggs, bacon and all manner of delicious smelling DIY breakfasts taunting and tempting us the whole way. Eating your breakfast in the very grounds of the festival watching the place slowly waking up as the morning fog burns off certainly starts that excited feeling that only this kind of festival can inspire. Just prior to 10am, Stu and I positioned our camping chairs just to one side of the sound mix tent where we had an excellent view of the side by side stages, ready and comfortable for a long day of The Gum Ball. To start off the day and brighten up the morning for some rather dusty heads, the Perch Creek Family Jug Band bounded on to stage not dissimilar to the endless enthusiasm of the Brady Bunch or Partridge Family, and we’re bedecked in much the same garb. 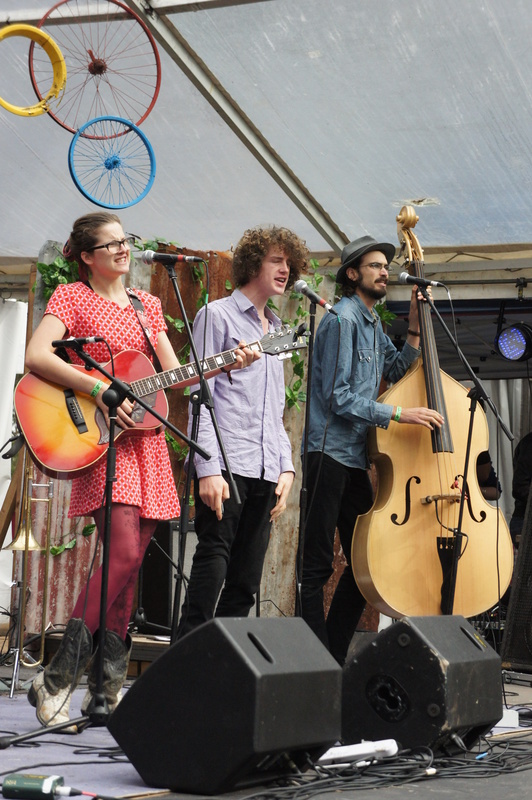 A 5 piece family outfit saw the stage awash with banjo, washboard and jug, acoustic guitar, harmonica and double bass all blending together in a wholesome family vibe. They produced great rhythm and a great way to start the morning. Recently turned 17, Christi has become the bad boy of the family, proving his status with a cover of Justin Townes Earl’s “If you ain’t glad I’m leaving, girl you know you ought to be”. The crowd quickly grew as daughter Eileen delivered a sultry cover of “Minnie the Moocher”. A bit kitsch but a whole lot of fun, their onstage family banter must have been what it was like for our Evan Hughes growing up in a folk family, as the kids all complain to mother Camilla that, in spite of her Train Whistle opening, they “don’t do the ready stances anymore”. But after some ‘gentle’ motherly advice and encouragement from the crowd (would I do a thing like that? *looks innocent*) they struck their very silly and quasi rock star poses and launched in to a bit of honky tonk, country tinged, bluegrass. It was all very cheesy, but in the right way for that time of the morning. I had to question whether there is anything this family don’t do? They are all multi-instrumentalists, Eileen tap dances with a mini banjo, the vocal harmonies while all the time sharing the spotlight and the instruments equally. And to round things out they finally brought out the jug in time for Christi to accompany the jug playing a saw in a lullaby style number. Family nights at their place must be amazing. A little later in the morning we were treated to the Irish lilt of Roesy. A modest chap, he thanked his family, saying he wouldn’t be here without them. 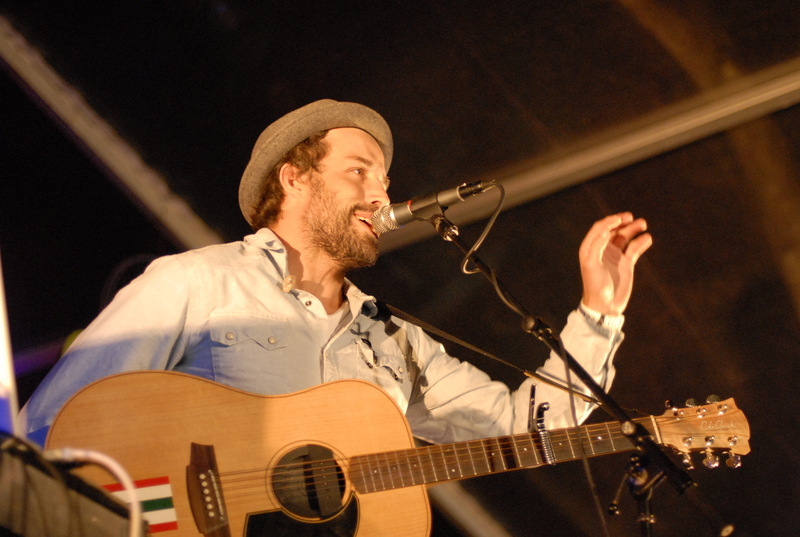 Performing solo with just his acoustic guitar, full voice and genuine story telling style, Roesy told tales and drew the audience in to his melody of worlds. Enjoying his set, I often felt like we may not have been at a festival but relaxing in Roesy‘s backyard while he told us tales of the songs his Dad used to sing. Benjalu is a name I have heard but not a band I have followed so I was interested to see what they had to offer. From the outset, it was clear they were on fire, sounding really tight with an excellent mix of acoustic guitar and electric. 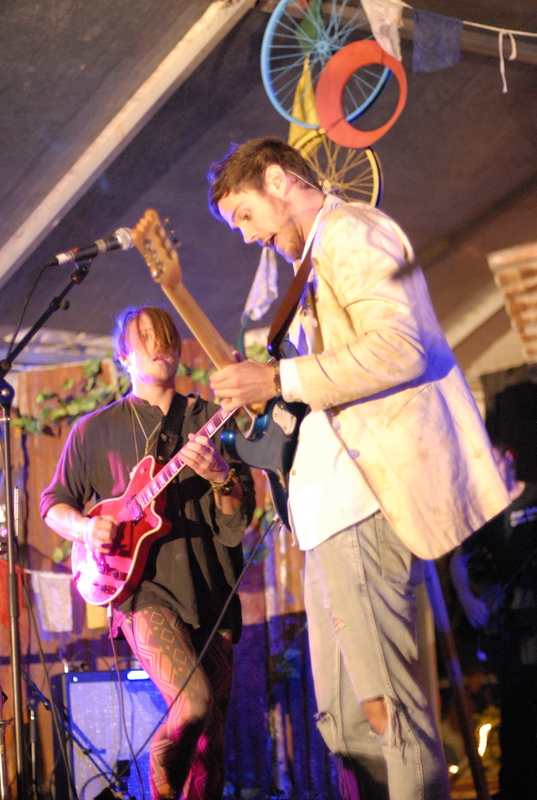 Their indie sound is heavily grounded in roots with a dash of rock and a touch of folk to round out their style. With their subtle harmonies and great energy, they had the crowd up and dancing instantly and it’s no surprise their infectious sound had the audience in raptures. I really enjoyed their song about being hungover complete with bongos for that pounding headache feel with strummy acoustic guitar and harmonized melody to sooth the soul. 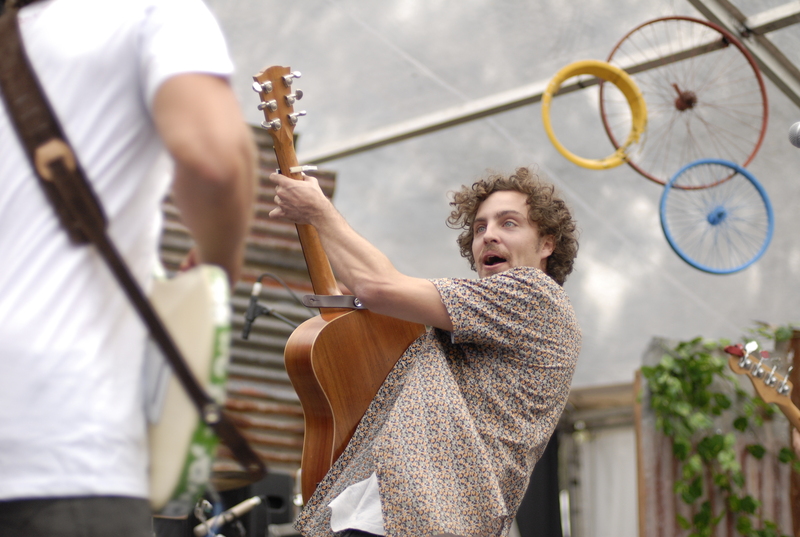 We’d seen him lurking at the back of stage but it was a great delight to see a cameo performance on their last song by none other than tour buddy Kim Churchill. It was clear that they had great rapport which delivers an excellent collaboration, they worked well together on stage and brought their set to a crescendo finish. Benjalu was an utter highlight and I shall be watching them like a hawk. 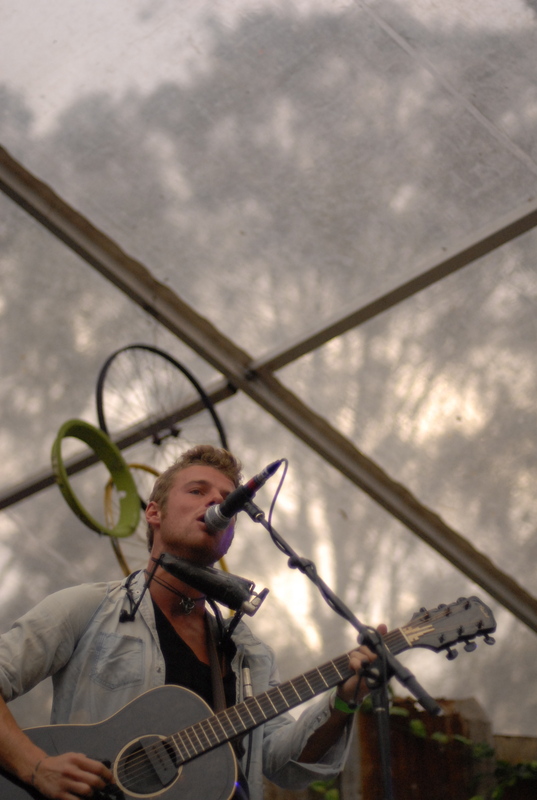 You all know that we here at TnS love Kim Churchill and we’re always very happy to see him on a festival line up. He took to the stage in his one man band style as we’re so used to seeing him. He opened with echos of “Waltzing Matilda” woven throughout “Loving Home” which attracted a big crowd to his set, it was clear people were drawn to him and his sound. In such a picturesque setting, it was easy to appreciate such musical layers all produced live by one person! Currently touring with Benjalu, it was clear they are all very good friends. He told the story of how Benjalu‘s van had broken down 2 days ago, that they have been saving every cent from every EP sold to record a new album and that he would hate to see that money to go to a van. During his next song, “Revolution”, donation buckets were going around collecting donations to help fix the van. Using his ethereal loop echo to advantage his passionate performance in songs both new and old, (like his LA song, telling how he dislikes the big cities), Kim’s raw performance energy is apparent. Close up, you can see him tremble as he performs, hands as they strum, face as he plays harmonica. Title track from his new album “Detail in Distance” is very reflective, he has learned over the years that sometimes distance is the thing that helps you see clearly. Kim likes to tell stories between songs, of how they came about. By far the most compelling was about a song written in French Polynesia while on tour, “Bathed in Black”, and how on a bad day he chose to change his own mindset and outlook. How a man in his early 20s could be so wise is beyond me, but I am grateful Kim Churchill is such a keen and regular performer who can bring this wisdom to us all through his enthusiasm and music. Wagons wasted no time getting deep in to the bluesy country goodness as they burst forth onto the stage. In the between song banter, Henry Wagons dedicate a song to all those bad choices made at festivals, and “I Blew It” rang around the festival arena. Jovial with the crowd, Wagons was not shy of dedicating the next song to all there, especially a woman in the crowd looking at him skeptically who he was determined to win her over in one song. A deep, pounding rendition of “Love Me Like I Love You” may well have succeeded. An emphatic “Willie Nelson” had the crowd singing along and Si the Philanthropist’s hip hop gave Henry a moment to wipe his brow and take to the drum kit. Wagons whirled through their set getting the crowd totally involved for an energy filled finale that left the gum trees ringing. Mat McHugh had quite the following gathered at front of stage well before his set began. His solo set up included an acoustic guitar and laptop to provide a variety of additional backing sounds as he launched in to “My Mind is an Echo Chamber”. I thought to myself that he sounded like a stripped back Jack Johnson or Xavier Rudd. 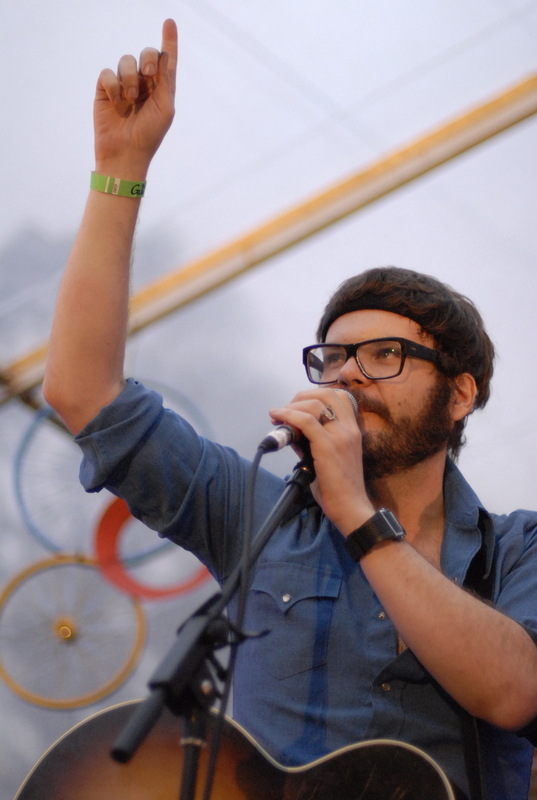 I looked him up on The Gum Ball site and realised he is the lead singer and songwriter of The Beautiful Girls. Cue the moment of feeling really ignorant, no wonder he sounded familiar. 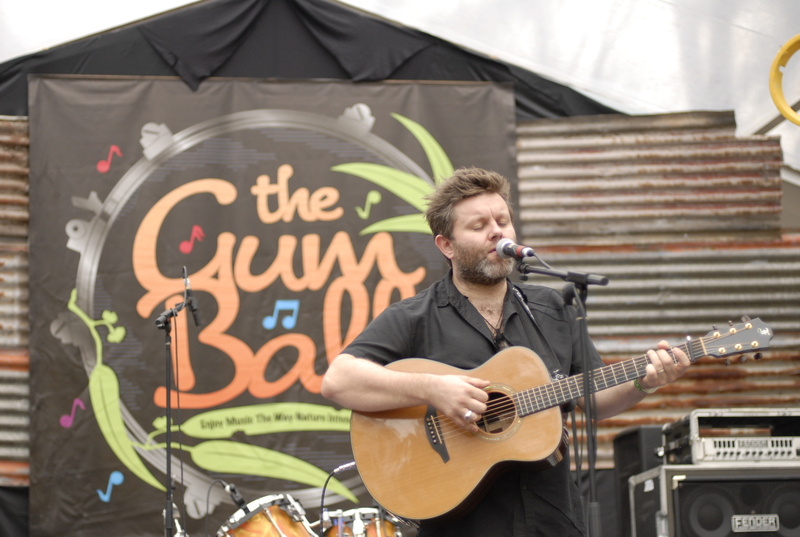 After touring solo in support of John Butler Trio, Matt discovered his new stripped back solo career and the Gum Ball audience seemed impressed with his new solo exploits. I’ve been a fan of Ash Grunwald for a while and enjoyed interviewing him at Bluesfest last year, but Stu had hardly even heard of him and looked at me dubiously as I enthused about his upcoming set with Vika and Linda Bull. As Stu stood in the audience ready to photograph the set, he casually chatted to the crowd who not only echoed my sentiments, but got Stu intrigued and pumped for the set. Ash delivered a powerhouse opening, engaging the crowd with thumping kick drum, strumming rhythm guitar and wailing vocals, brought down to a cool, bluesy lament. With notes like gospel howls, Ash’s voice took over the Gum Ball arena and the crowd was transfixed. He then welcome Vika and Linda to the stage and using a loop recorded in Melbourne of Linda, which according to her “sounds like my grandpa” brought a whole new dynamic of sound to the festival. Ash sang and delivered running commentary throughout the set, nothing phases him. He explained that the chorus of his next song was inspired by The Hangover II, the tattoo faced “Demon in Me” from his new release Trouble’s Door. A diverse set, the next song built from a slow start into a speedy intro for “Shake that Thing”. With out hesitation he slid in to a cover of “Sail”. Ash’s voice carried over everything, electronic backing track, the swagger of the guitar and sultry backing vocals by Vika and Linda. An a Capella with a gospel style changed the feel of the set but still had the audience clapping and singing along. A grungy recorded backing loop accompanied “Raw” which true to it’s name has a raw sound and heavy dirty beat. At the end of the set, he thanked good friends Vika and Linda as this was their last performance together in the collaborative format for some time as Ash moves forward with promotions and tour for his new album Trouble’s Door. After the set had finished, Stu returned to our spot, grinning. 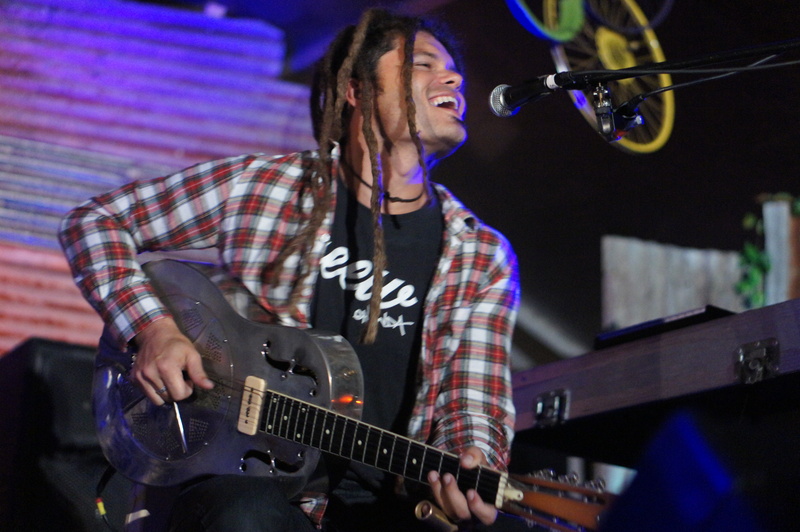 Turns out Ash Grunwald had been awesome. We had munched on some terrific festival food including the Wagons‘ endorsed wood-fired pizzas, and enjoyed dutch poffertjes for dessert and then it was time for the dessert finale of Jinja Safari. Their excitement was evident as they took to the stage, full of energy and life. Without hesitation they delivered their ethereal, tribal drum soaked intro, layered with harmonies and rich melodies oozing forth over the crowd with everyone swaying in time. Their set was smooth and sweet like treacle and the perfect ending to a rolling, rollicking, eclectic day of music. The keyboard was fanciful and lyrical and they all danced with their instruments while they performed, the bongos energetically shooting between phrases of songs. We collapsed in to our camp beds exhausted but very satisfied by a fantastic festival with a well considered and varied line up to cater to a wide range of audience tastes. It’s hard to believe that The Gum Ball has been going for 8 years and hasn’t yet exploded in size or grown too big for it’s earthy and natural soaked site. We arrived home just after lunch and were really impressed to have fit a trip out of Sydney and so much music in to one weekend and still have time to relax before the working week started. Clearly the folks at Lower Belford and the surrounding Hunter Valley know how to put on a truly inclusive and inviting gig and the locals have discovered what a gem it is, now the Sydney-siders and Central Coast people just need to clue on and The Gum Ball will soon become a sell out success year after year. This year some punters had traveled form Canberra just to see headline act Custard and they wouldn’t have been disappointed with their set as well as the whole event. So it’s a sure thing that next year’s Gum Ball will have just as brilliant a line up and hopefully, as they note in their wrap-up blog post, a whole lot more people will come and enjoy the festival alongside the regulars.